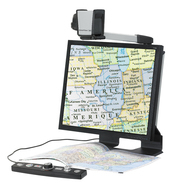 Smartview 360 « AbleTech Assistive Technologies Inc.
With its integrated Sony camera and monitor, the SmartView 360o magnifies images to help you clearly see the world around you. It’s easy to position the camera to see across a room, enlarge any text or act as a magnifying mirror. It’s easy to rotate, point and position the SmartView 360’s camera to where you need to see — either in front of the monitor or to the side. When moved from one position to another, the camera parameters are automatically saved to memory for quick recall. View text in a book with the black and white enhanced contrast or simply twist the camera for a full-color image of a blackboard or presentation screen. With its new integrated Sony camera, the SmartView 360 offers an improved visual experience. Whether you are in an illuminated or dark room, the SmartView 360 now provides sharper, clearer and more stable images which means smoother reading and more comfort for your eyes. Classroom Work: Studying and homework are made easier through the power and versatility of the SmartView 360. From the blackboard to books, students of all ages can quickly and easily move the camera for a clearer view. For Seniors: The SmartView 360 makes everyday life much easier. Simply point the camera to read important instructions, books and mail, and for personal tasks such as applying make-up and styling hair. At Work: In the workplace the Smartview 360 can be used for viewing presentations, reading documents and even using small tools.